Scar development is a part of the skin’s healing process in response to wounds. According to the American Academy of Dermatology, scars generally start to fade naturally within 6 to 18 months. The extent of the scar depends on the severity of the initial wound. Some scars can be prevented by proper bandaging of wounds and by not picking at scabs. Minor scars do fade, but more severe wounds can leave long-term scars. In such instances, you may consider a medical treatment to help fade the scar or make it less noticeable. Keep in mind that there is no guarantee with any medical procedure for scars. Creams are available in both over-the-counter and prescription strengths to help minimize scars. These creams often contain silicone, which helps reduce the thickness of a scar. Silicone may also help relieve the initial pain associated with a fresh scar. Still, medications must be used over a long period of time to see keep seeing results. Once you stop using a cream, the scar may become more noticeable. Surgery is a dramatic way to help remove the appearance of a scar. According to Medline Plus, scar revisions are most appropriate within two months to a year after the initial wound heals. A dermatologist will likely recommend surgery for your scar if it is in a noticeable area, such as the face, or if it is particularly wide and long. Surgery may seem counter-productive, since the procedure itself may result in another scar. The American Academy of Dermatology explains that long scars are made shorter and wide scars are closed to be smaller during surgery. Your doctor may even move the scar. For example, a prominent scar above the eyebrows may be moved higher up on the forehead where your hair can help cover it. 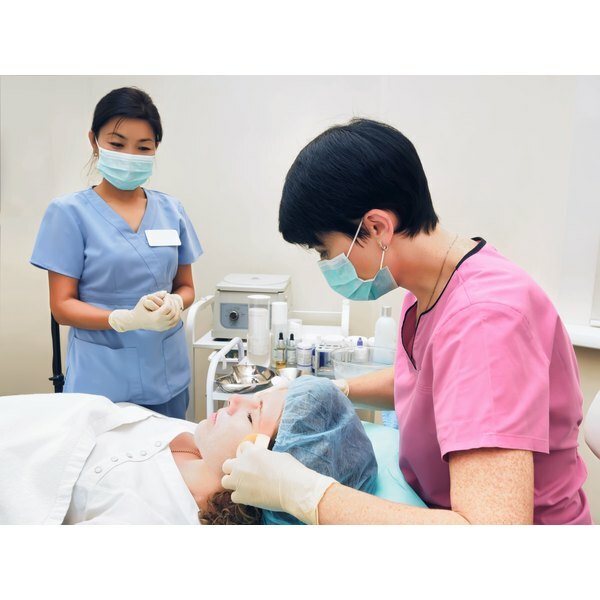 Dermabrasion is a method used to help remove the skin’s outer surface to help smooth a scar. Smoother scars are not as noticeable as ones that have texture. A chemical peel is another type of skin surface treatment, but t involves making your scar match the rest of your skin by changing its color. Cortisone and collagen injections may also be recommended by your dermatologist. While your scar is healing, you might consider covering it with makeup to help reduce the appearance. Scars do diminish over time. As you age, the affected area becomes smoother and lighter in appearance. The American Academy of Dermatology says that a scar never completely goes away, no matter what type of medical treatment you use. This is important to keep in mind as you decide whether you want to use an expensive surgical treatment to help resurface the scar. Surgery can also cause side effects such as infection. The type of treatment you choose depends on the severity of the scar and how much it bothers you. Talk to your dermatologist about all of your options. What Is The Best Thing to Get Rid of Scars on My Leg?